Note: The download and installation has to be done with Internet Explorer or Edge and can be a somewhat annoying task depending on your setup. The module is installed into %localappdata%\Apps which also can be rather inconvenient, only making it available for the user profile that downloaded and installed it. The content of the entire download and installation looks like below. Putting the actual module to use is the next task here. What I like to do first though, is to copy out the entire folder from above to another location. The current location in %localappdata% doesn’t make sense to me, and I rather want it stored differently. Also, before being able to authenticate we need a set of credentials. I have covered this in previous posts, but if you need to do something automated you need to include an automated way of authentication. Read-Host -Prompt "Enter the password for your service account" -AsSecureString | ConvertFrom-SecureString | Out-File "<Enter File Path>\EXO-ADAL.txt"
On to the loading the actual module. 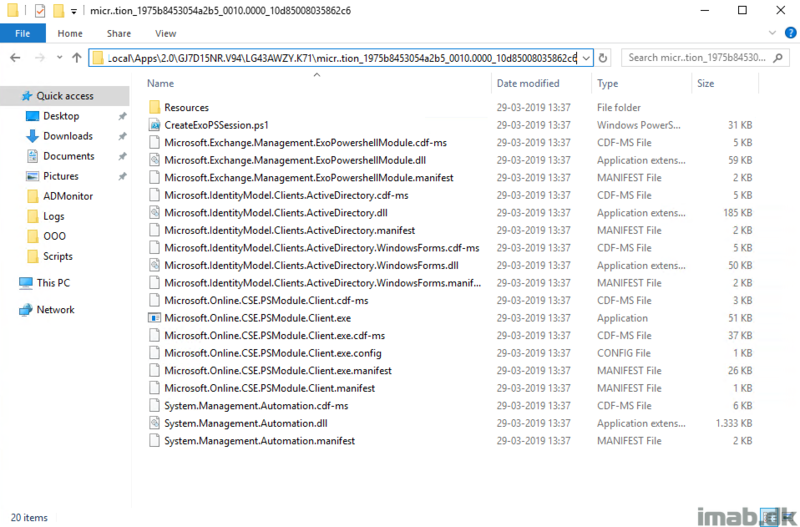 And this was the tricky part, which isn’t documented anywhere on Microsoft Docs. 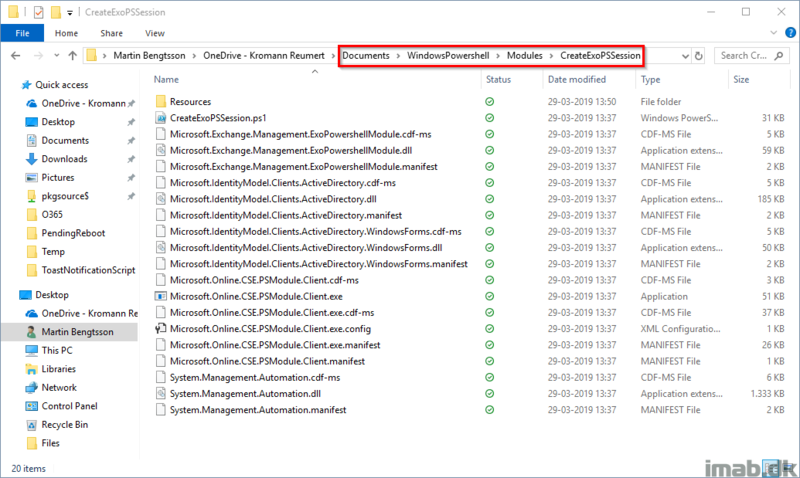 Loading the module is done with following Powershell script. You will find yourself with a solid way to authenticate and automate against Exchange Online in a secure manner using Modern Authentication while still being protected by Conditional Access. 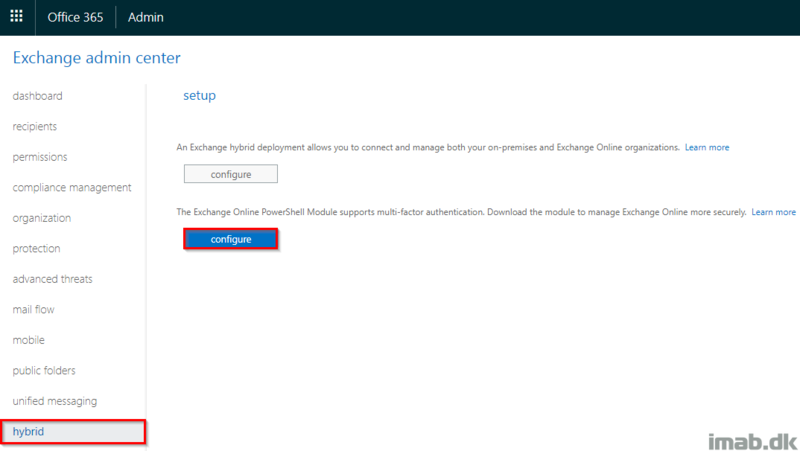 You should always use the Powershell module from the echange online portal as this gets updates regularly. This way you always have the latest cmdlets ar your disposal. Other than that it’s a great way to quickly connect from several machines.